Introduction: The science underpinning mass-gathering health (MGH) is developing rapidly. However, MGH terminology and concepts are not yet well defined or used consistently. These variations can complicate comparisons across settings. There is, therefore, a need to develop consensus and standardize concepts and data points to support the development of a robust MGH evidence-base for governments, event planners, responders, and researchers. 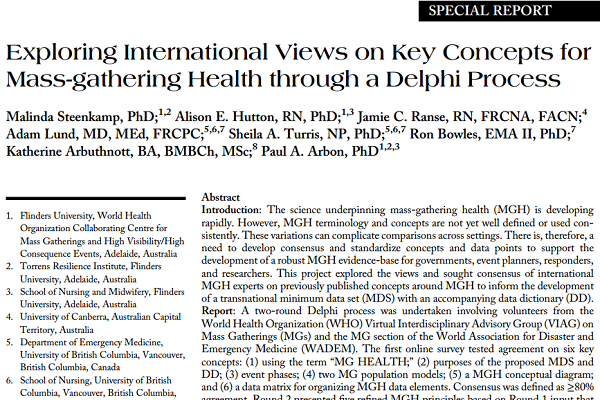 This project explored the views and sought consensus of international MGH experts on previously published concepts around MGH to inform the development of a transnational minimum data set (MDS) with an accompanying data dictionary (DD). 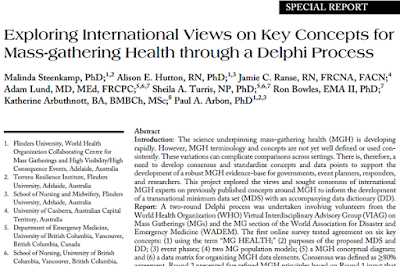 Report: A two-round Delphi process was undertaken involving volunteers from the World Health Organization (WHO) Virtual Interdisciplinary Advisory Group (VIAG) on Mass Gatherings (MGs) and the MG section of the World Association for Disaster and Emergency Medicine (WADEM). The first online survey tested agreement on six key concepts: (1) using the term “MG HEALTH;” (2) purposes of the proposed MDS and DD; (3) event phases; (4) two MG population models; (5) a MGH conceptual diagram; and (6) a data matrix for organizing MGH data elements. Consensus was defined as ≥80% agreement. Round 2 presented five refined MGH principles based on Round 1 input that was analyzed using descriptive statistics and content analysis. Thirty-eight participants started Round 1 with 36 completing the survey and 24 (65% of 36) completing Round 2. Agreement was reached on: the term “MGH” (n = 35/38; 92%); the stated purposes for the MDS (n = 38/38; 100%); the two MG population models (n = 31/36; 86% and n = 30/36; 83%, respectively); and the event phases (n = 34/36; 94%). Consensus was not achieved on the overall conceptual MGH diagram (n = 25/37; 67%) and the proposed matrix to organize data elements (n = 28/37; 77%). In Round 2, agreement was reached on all the proposed principles and revisions, except on the MGH diagram (n = 18/24; 75%). Discussion/Conclusions: Event health stakeholders require sound data upon which to build a robust MGH evidence-base. The move towards standardization of data points and/ or reporting items of interest will strengthen the development of such an evidence-base from which governments, researchers, clinicians, and event planners could benefit. There is substantial agreement on some broad concepts underlying MGH amongst an international group of MG experts. Refinement is needed regarding an overall conceptual diagram and proposed matrix for organizing data elements.